An honest, straight-forward look at the jobs picture in the US economy probably depresses even the most optimistic of us. With the November jobs report showing smaller-than-expected job losses of only 11,000, it is possible that we see our first gain in jobs next month since the beginning of the current recession. Without job additions and productivity improvements real, sustainable economic growth cannot be generated. Stimulus initiatives can provide short-term gross domestic product boosts but generally fizzle out as the well runs dry. 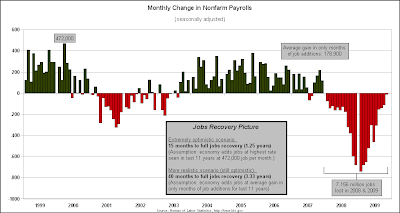 Looking at the monthly change in nonfarm payrolls, 7.156 million jobs have been lost in 2008 and 2009. Given the equity market's impressive 65% gain since the March 9th lows and renewed bullish calls on the economy, it is instructive to examine the likelihood of a quick recovery. The S&P is now trading only 28% below its all-time highs made in October 2007. So, how fast will the economy recover? In an extremely optimistic scenario, it would take the United States over 15 months (or 1.25 years) for a full jobs recovery. This scenario is based on the wildly upbeat assumption that we could begin adding jobs at a rate equivalent to the highest month seen in the last 11 years at 472,000 jobs per month. In a more realistic scenario, yet still quite optimistic, the economy would fully recover the lost jobs in 40 months (or 3.33 years). This is based on the assumption that we would add the average monthly gain seen in the last 11 years only in months where the US economy added jobs every month. With CareerBuilder's 2010 Job Forecast showing that 61% of employers have no plans to change staffing levels next year, even this scenario seems doubtful. Based on these two scenarios, it is clear to see that this will likely be a long, slow recovery in the US economy. This does not mean there won't be money to be made in asset classes around the world. Liquidity-driven rallies in markets can be sustained far longer than most would expect. Greater dislocations in currency markets seem probable in the next few years. Traders can always make money because of their flexibility. Yet, be aware of the cheerful economist touting a quick recovery.